The system is enabling HAL to dramatically reduce the time, cost and errors associated with carrying out work on underground services, as well as helping the company to comply with its strict health and safety standards. The system uses RFiD technology to record and find underground power systems, water, fuel pipes and communications networks. Although HAL already knew the approximate location of most of these, the new 3M system enables them to find the precise spot, rapidly and efficiently. This is important to HAL, especially considering the particular challenges involved in airport engineering and maintenance. For example, runway digging can only be carried out during the night when aircraft are not flying. Not only does this mean that work needs to be completed very quickly, contractors have the added problem of working in the dark, so finding the right manhole cover first time, rather than having to try a number of them, is both faster and more cost-effective. Due to the amount of construction work taking place at Heathrow, services are often installed on a temporary basis and may be moved several times. Health and safety issues include avoidance of digging within a three metre radius of any fuel pipe. The 3M system helps contractors to avoid this happening. Says Andrew Rhoades, Head of Service Protection, HAL (Heathrow), “The 3M system means we can plan work more effectively. We save time and money, as well as managing risk. I anticipate a rapid return-on-investment.” Andrew has estimated that the cost of installing each 3M location marker is £13-15 per service pit, compared to £100 for each incorrectly lifted manhole cover. 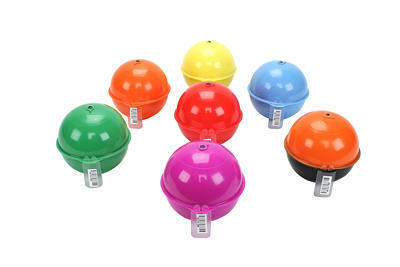 The theory behind the ball marker system is simple: ID markers – plastic balls, containing fluid and a passive sensor – are inserted when cables or pipes are being installed. Each particular joint or junction might have an individual marker. The iD markers can be programmed to include specific information, such as type of application, depth, placement date, joint type and other useful details. The data is written to the marker ball using the 3M™ Dynatel™ 1420E or 2200ME-iD Series Locator, a handheld, battery-powered device, which can store records for up to 100 marker balls. This data can then be forwarded to a computer system. When further work needs to be carried out, the same handheld locator is used to send a radio signal tuned to the ball marker associated with that particular utility – for example, gas, water or electricity – and the ball marker not only sends back confirmation of its exact location, but also the additional data stored. The potential benefits of the 3M iD Ball Marker System have been further enhanced by a solution developed by RFiD specialist, Key2iD, which has developed middleware that links the 3M system to GIS and other systems. In the case of HAL, data about the exact co-ordinates of the marker balls is programmed into the markers direct, and this data can then be uploaded to the company’s CAD and GIS systems after the installation stage. HAL use this data to update their CAD drawings, ensuring that information is always up-to-date. 3M is a $32 billion diversified technology company with leading positions in consumer and office; display and graphics; electronics and telecommunications; health care; industrial; safety, security and protection services; transportation and other businesses. Headquartered in St. Paul Minnesota, the company has operations in more than 60 countries and serves customers in nearly 200 countries. 3M, which marked its 110th anniversary in 2012, is one of the 30 stocks that make up the Dow Jones Industrial Average and also is a component of the Standard & Poor’s 500 Index.